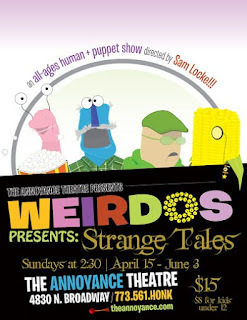 Once upon a time I went to a show and it was called Weirdos Presents: Strange Tales. It was about this old puppet man in a hospital (Sherman Edwards) who didn't want to go to bed, and this nurse (Tahnee Lacey) came in and she would say, "Go to bed. You should." But he wanted to stay up all night and eat cheese. At least that is what is what he told her. I suspect he just wanted to stay up; I'm not sure about the cheese part. And then he says, "I'll just tell you one short, little story. " But it turns into like an hour-long story when the nurse wants it to be like three minutes. So that is totally not like one very short story like he says. He is telling all these different stories, all in one. I'm going to make an estimate: it turns into about twelve stories. I liked that they made it more unusual by making it not like a child sitting on their grandfather's knee and him being like "I'm going to tell you a story, little girl." But instead they made an old guy telling a nurse who is a grown woman. And he is like in a hospital because he is weird--like that whole cheese thing. This is very gratifying because it is unusual and it gives you an idea that it is going to be a weird and cool show. I think the designs of the puppets are terrific. Some of my favorites were Hansel and Gretel, Kernel the Colonel and the old man puppet--I think it looked a lot like a Muppet. There were all different kinds of puppets: finger puppets, hand puppets, and rod puppets. I liked the scene where Hansel and Gretel were going to be cooked into a children stew by an evil witch (Colleen Breen). I liked the puppets of Hansel and Gretel. They didn't look like you'd imagine Hansel and Gretel; they looked like alien Hansel and Gretel. They were blue and pink which is not usually what the color of their skin is and they had eyes on top of their heads, like Elmo's. I thought it was funny because it had funny weird things like the witch dropping the keys right in front of the cage and the witch immediately taking the cage off Hansel and Gretel so they could totally get out. I thought that was really funny because the witch is not usually as clueless. Hansel said, when they were like fighting, "It's, like, candy, man! You aren't going to expect children to come up and eat it?!" I thought that was really hilarious because he has a point. You should expect people to come up and eat your house when it is made out of delicious candies. If I were Hansel and Gretel, I would go straight for the tootsie rolls, chocolate lollipops, and happy hippos. I though the scene with the evil, pie-gangster mice was fun. Little Red Riding Hood (Tahnee Lacey) had some pies that she was taking to her grandmother. And that is the main plot of the story. So she passed some mice, and they asked her, "What are you doing?" And she said, "I am bringing some pies to my grandma. And then they said, "Oh pies? Pies! Pies!" And then the king of all mice (Sherman Edwards) came out and was like "Pies! Give us your pies!" And then a very muscular Pied Piper (Colleen Breen) came and was like, "I'll save you!" But then he got swallowed by the evil gangster mice, and that wasn't very pleasant. It was funny because the Pied Piper was being defeated by miniscule mice. I really liked the scene with the prince (Sherman Edwards) and Little Red Riding Hood. It was basically like Beauty and the Beast, only backward. That was a beast that wants to turn into a prince, and this was a prince that wants to turn into a beast. She's like, "Oh, Hi," and then the Prince says "Hi" in a glum manner. So then she's like "What's wrong?" And he says, "I used to be a handsome monster, and now I am an ugly prince." And then she says, "You are not that ugly. I've been looking at you, and I actually think you are pretty handsome." The he says, "I just have to be kissed by a beautiful girl and I will change back." And then she kisses him. And then he comes out as a weird-looking, eight-eyed monster. And then she says, "That was totally worth it!" I really liked that it was funny and had to do with romance. I like romantic plays and movies and stuff. Even though it wasn't very romantic, I still think it is a romantic thing to kiss someone. In the scene where Colonel Kernel was warning his friend (Aaron Sjoholm) that there was a wolf trying to eat him, the Wolf (Ben Palin) would make totally unbelievably not disguise-y disguises. For example, he made himself look like a rain cloud, a hippie, and a 1920s newsboy. So the newsboy would say, "Great Depression coming up! Great Depression coming up!' And Colonel Kernel's friend would say, "That's a while later, but I'll take your paper!" I think it is funny because why would a 1920s newsboy be there anyway? Like, what the what? So when the Colonel was like, "No! The wolf is really there," the friend was like "Have you ever heard the story of the boy who cried wolf?" And then the Colonel was like, "Yeah. And when all the townspeople kept coming back, the wolf wasn't there." And then his friend is like "Exactly" and then he left. And then the Colonel said, "Now it is not like the boy who cried wolf at all because you just left. And you're not a townsperson!" I thought the scene with the grandpa and the Wolf was funny. The grandpa was giving the wolf, who was in the grandma's outfit, gifts. There was a razor because the grandpa says, "You know, I am giving you this razor because you look a little bit like a wolf." So he got so-called "her" some flowers that she was supposed to stick in her nostrils, which is totally ridonkulous. He's saying that because he's doing his version of the scene where Little Red Riding Hood says, "Oh, Grandma, what a big nose you have!" So then he went into this whole thing about him taking naps in her nostrils. I think it is funny because the grandpa is a puppet and the grandma (Colleen Breen) is an actual lady. And so it could be like he actually had naps in her nostrils because he is smaller than a grown human. 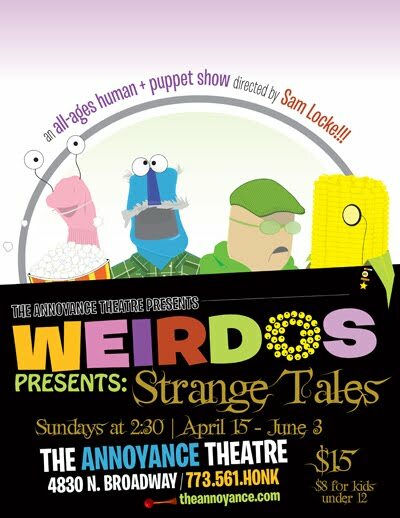 People who would like this show are people who like puppets, comedies, and eating cheese. I think this show is fun, imaginative, and cool. I think this show should be for ages 3 and up. Older kids will like it still because it is funny. If you have a sense of humor, you will double like it. People should see this show because it is totally rad. Ada - Thank you so much for coming out and reviewing our show. We were so very honored to have you there!